Call it the original supergroup. When DC Comics debuted the Justice League in 1960 it brought together some of its biggest and best names—Superman, Wonder Woman, Batman, The Flash, Green Lantern, Aquaman, and Martian Manhunter—under one banner. Since its formation the Justice League has undergone a number of transformations, but perhaps none so phenomenal as the rebirth given them by writer/artist Darwyn Cooke, the brains behind the animated film Justice League: The New Frontier, which recently premiered on DVD. The movie is based on Cooke’s DC: The New Frontier, a six-issue limited series originally published in 2004 and winner of the Eisner Award, one of comic books’ most prestigious honors. New Frontier finds the Justice League mired in the post-war America of McCarthyism, Communist paranoia, and the Space Race, a time where superheroes are under suspicion and distrusted by much of the world. Working from this historical cocktail, Cooke reimagined the birth of comics’ greatest team. Cooke was born in Toronto in 1962 and says he began writing comics as a childhood hobby. His first professional piece was published in the mid-’80s, though he only began to publish frequently within the last decade. He spent much of the 1990s working as an animator and storyboard artist on Warner Bros.’ Batman: The Animated Series. Though he has done some work for Marvel, including a short run on Spider-Man, he has primarily worked on titles for DC, including Superman Confidential, Catwoman, and The Spirit. While comics’ early years are generally known as the Golden Age—spanning roughly 1938 through 1951—the so-called Silver Age began in the mid-’50s and served as a renaissance of sorts. Comics found a resurgence in popularity as stories and characters began to be based more on science than fantasy and took on greater psychological complexity. 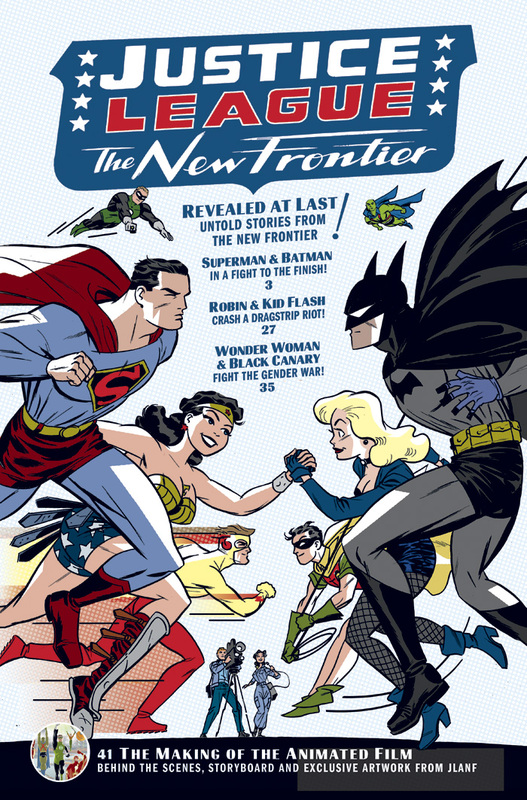 DC: The New Frontier covers the entire spectrum of the DC Universe, bridging the gap between the Golden and Silver ages. Cooke’s original comic features early Golden Age DC characters such as Hourman, The Suicide Squad, The Challengers of the Unknown, and more. All of them are touched upon in the film, though not with as much detail as in Cooke’s original, which includes a number of subplots that had to be cut in order to successfully adapt a dense six-part graphic novel into a 75-minute film. Despite economizing much of the story, Cooke and others behind the film still found ways to stay true to the broader concept of the source material. In addition, the special includes stories focused on Wonder Woman and Robin, as well as a section detailing the art of the film itself. Warner Bros. is releasing the film in two editions, a single-disc edition and a two-disc set including multiple commentaries and special features. Several big names lend their voices to the film, including Kyle MacLachlan (Superman), Jeremy Sisto (Batman), Kyra Sedgwick (Lois Lane), and Neil Patrick Harris (The Flash). But despite such an effort to produce a quality film, many studies find comic book sales continually decreasing despite their cultural prominence over recent years, a trend that understandably distresses Cooke. For Cooke, one of the pleasures of New Frontier was the opportunity to set aside much of the history and continuity and start fresh. I was really surprised by this movie. It really captured the ‘50s. I think we’re at a point in history now where I think most 9-year-olds would think that Spider-Man was a cartoon that they made a movie out of—not that it was ever a comic book….